Designing DACs for more than 25 years has given us keen insights for future ready products. Now, more than ever, our product range has the most flexible architechture yet. California based in-house development and manufacturing has evolved the digital front-end to a new level of playback. Jonathan, along with his brother Daniel, grew up in the high-end audio world. Ever since he was a child he has been working with electronics with the focus on audio. Having been a part of MSB most of his life, he has done every aspect of the business giving him a better understanding of both what the customers need and how to create amazing product. After graduating university with honors with an Electrical Engineering degree, Jonathan has worked full time at MSB. One of his first projects was the development of the DAC IV and the Data CD IV products. Since 2006 he has been the engineering manager overseeing all projects to make sure that products are designed with the optimal integration between functionality, sound quality, and reliability. He has continued the MSB tradition of keeping the majority of cost is to be spent on the sound quality and performance, and not the chassis itself. Jonathan also manages all the technical support for all of the products. If a customer is having trouble with a product , Jonathan has been involved in getting the problem resolved. All repairs are performed or overseen by Jonathan directly allowing him to implement new production procedures or design changes to prevent them happening again. By working directly with the customer, it allows him to understand the end users needs directly, which greatly influence new product designs. In 2016 he became an owner and the CEO. He continues to be the engineering project manager and designer while performing sales working closely with our distributors. He works with the other designers closely as a team and only through the close cooperation between all of the designers is MSB able to produce the great products that we have. There is no product produced that is completely ones person design, everything is worked on together as a team. Jonathan believes that one person can make a good product, but it takes a team of designers to make a truly great product! In Jonathan’s free time, he enjoys the outdoors. He loves going on hikes in Yosemite and backpacking in the Sierra Nevada mountains. He lives on a farm and with his wife they have their own vegetable garden. He also enjoys traveling and looks for any excuse to go see somewhere new! Daniel oversees all of the mechanical design and manages the production and shipping department. His passion is product design and creating product designs that bring people joy. His daily tasks are managing the entire production process from start to finish to ensure the quality we demand. Not only does he design, the product, he programs the CNC machines and keeps them running every day. Jonathan and Daniel both brothers and co-owners of MSB. They work closely with each other maintaining the legendary legacy of the top performing products on the high end audio market They were both born into the high end audio world and it is in their blood. From a very young age, both brothers were in the shop soldering and fabricating products. After graduating with a degree in Mechanical Engineering with honors at age 20, Daniel joined the MSB team. The first product he developed was the Analog DAC. Another early key addition was adding a full machine shop to the company, critical in making so many of our products a reality. Without formal CNC training, Daniel was given a Haas CNC milling machine and he quickly mastered the process reducing delivery times and increasing finish quality. The Analog DAC chassis was our first full product made completely in our factory using American sourced materials and our own CNC machines. With transition of in house fabrication directed by Daniel, he was able to improved product quality and reduce costs. Daniel is also able to create a prototype a product in a single day, allowing him to create 5 different versions in a single week allowing for the design to meet our desired results. Daniels crowning achievement is the case design for the Select DAC II. It took countless design reiterations and all of the skills he learned over the last five years to create. Working with a solid 3″ thick unibody design was a challenge to be conquered. After many design prototypes, the current Select DAC II design was achieved with complete satisfaction. The process requires more than 80% of the raw aluminum to be removed from aluminum billet requiring 8 hours of machining per chassis. Complete integration of the display, knob control, modules, and heatsink integrated into one sleek package. Finishes of the highest standard were required and pushed the limits of what MSB was capable of. Daniel is very excited for the future designs we are working on. According to Daniel, even after 25 years, MSB is just beginning to unlock the potential of what high-end audio can become. This is Vince Galbo; he is our US Sales Manager. He is responsible for setting up dealers and promoting our products in the North American region. If you are interested in hearing the potential that an MSB product has to offer, contact Vince and he will connect you with one of his hand-picked dealers. Vince has been an avid audiophile since 1975 and has spent much of that time increasing his knowledge about how sound quality and technology relate. He has an extensive background in practical mechanics and electronics that enables him to finely tune each system to achieve its maximum potential. He has installed many audiophile two channel systems and large home theaters with an edge on audiophile performance. He has experience in sales in multiple fields, most recently in audio product distribution. He believes that the most important component in a system is the source and has joined MSB to promote and build sales of all MSB products and has been working hand in hand with MSB since 2001. Frank is a passionate musician and manages the MSB Showroom in Antwerp. His experience with High End Audio and system tuning as well has his interest in music reproduction and acoustics allow him to maximize the performance of the MSB products and the system they are combined with. His passion for music and his humble helpful attitude combined with a good ear make him a great brand ambassador. He supports the European MSB Distributors and International dealers and assists with shows and press. For countries in Europe where we do not have a partner, he’s the first contact to go to. If you would like to discover the MSB products, contact him and he will connect with the right dealer. MSB è leader nella progettazione e realizzazione di componentistica elettronica utilizzata da diversi costruttori nall’interno dei loro prodotti. La tecnologia sviluppata internamente all’azienda ha permesso di realizzare circuitazioni innovative e performanti a tutto vantaggio delle prestazioni audio. Il DAC è un circuito che converte misure di ampiezza audio espresse in digitale (quindi a passi discreti) in un continuo analogico che rappresenta il suono da riprodurre. L’ampiezza è un numero digitale (come una parola da 16bit) mentre i passi sono determinati dalla frequenza di campionamento del segnale (as esempio 44.000 volte al secondo). Questo processo di conversione può essere paragonato per similitudine ad un nastro trasportatore infinito con dei contenitori vuoti di capacità stabilita (es 1 litro) che scorrono con esso, mossi come in una catena di riempimento. L’obiettivo del DAC è riempire ogni contenitore del livello di liquido nel modo più esatto possibile che la musica ci specifica. Ci sono 3 tecniche per effettuare la conversione: Delta Sigma, Ladder e MSB Sign Magnitude Ladder. Nel sistema di conversione Delta Sigma (one bit) ogni singolo contenitore è riempito al giusto livello tramite diverse tazze che hanno la medesima capacità. Ogni “one bit” tazza può essere piena o vuota. Con un oversampling di 64 volte la tazza ha una capacità di solo 1/64 del contenitore da riempire mentre per essere accurata dovrebbe avere un volume pari a 1/ 2 elevato alla 24 cioà 1/16.777.216. La velocità della linea è la frequenza di campionamento (44.000 al secondo). Tramite accorgimenti matematici e mantenendo monitorato e predetto l’andamento dell’errore è possibile raggiungere una qualità di conversione molto accurata ma solo con l’utilizzo di un filtro molto aggressivo sull’output che porta con se svariate controindicazioni. La tecnologia ladder DAC è differente poichè vengono utilizzate per riempire i contenitori che scorrono sulla linea di riempimento, non più tazze di un unica misura (one bit) ma un intero set di tazze dalla più piccola alla più grande. Per riempire il contenitore alla giusta misura può essere utilizzata una qualsiasi combinazione di tazze. Nessun filtro è richiesto ma l’errore finale è definito dalla somma degli errori di ogni singola tazza utilizzata. L’ MSB Sign Magnitude Ladder DAC utilizza la medesima tecnologia raffinandola però in due modi. Poichè tipicamente i contenitori sono pieni a metà una volta riempiti (la media delle ampiezze è circa la metà dell’ampiezza massima) vengono fatti scorrere sul nastro contenitori già pieni a metà invece di contenitori vuoti. A questo punto si usa lo stesso set ti tazze del ledder DAC per aggiungere o togliere dal contenitore fino a raggiungere la misura desiderata. Ancora una volta non è necessario alcun filtro poichè il contenitore è riepito esattamente ed inoltre, poichè è necessario aggiungere o togliere solo una piccola quantità, l’accuratezza è maggiore. L’orecchio umano è maggiormente sensibile alle frequenze che corrispondono alla metà del contenitore ed è proprio lì che si concentra tra l’altro la maggior accuratezza di questa tecnologia, dove le tazze da utilizzare per raggiungere la misura voluta sono molto piccole. Il Platinum DAC di seconda generazione è un progetto MSB (R2R Ladder DACs) che deriva dalla tecnologia ladder ma con miglioramenti sostanziali che gli permettono di operare (tramite upsampling) ad una frequenza di campionamento fino a 3MHz. La conversione è realizzata tramite 4 di questi moduli DAC MSB a 24bit configurati in in un’architettura completamente bilanciata per una operatività ottimale in bilanciato o single ended. Convertire uni e zeri digitali in musica è un’operazione estremamente delicata e critica. Ogni singolo campione che costituisce il messaggio audio deve essere convertito in un voltaggio analogico in alta risoluzione che possa essere trasformato in suono per le nostre orecchie. Ogni passo mancante o mal eseguito può irrimediabilmete corrompere il risultato finale determinando un suono che nulla ha a che vedere con la registrazione madre. Errori di “traduzione” originano irrimediabilmente colorazioni, distorsioni e velature mentre la minimizzazione di ogni eventuale problema permette al suono di splendere nella propria originalità. La riproduzione audio ha inizio quando il DAC riceve il codice binario di informazioni da parte della sorgente. Il primo passo prevede il recupero dei campioni audio (che rappresentano le tensioni di uscita finale) e la tempistica (clock) che ordina al DAC quando rilasciare questi voltaggi. Una volta impostata la frequenza di campionamento i dati vengono filtrati digitalmente. Si potrebbe anche alimentare il DAC con i campioni audio originali evitando il filtraggio digitale ma questo avrebbe numerose controindicazioni. Dopo essere stato filtrato digitalmtente, il flusso dei dati viene trasferito al DAC. Il DAC riceve questo flusso e lo converte il tensione analogica continua. Nel corso degli anni di progettazione ed affinamento della tecnologia che costituisce il cuore del Platinum DAC, MSB si rende conto che i limiti nella riproduzione musicale non erano più dovuti al DAC ma piuttosto al filtro digitale che alimenta in DAC stesso. Il Burr Brown DF1704 che era il miglior filtro digitale sul mercato e che aveva servito egregiamente in passato era diventato ormai un collo di bottiglia con l’introduzione della seconda generazione dei moduli DAC la quale aveva dato un impulso eccezionale alle performances del DAC stesso. Il filtro digitale è necessario poichè esistono frequenze con immagioni speculari che devono essere rimosse. Se il DAC non avesse a monte un Filtro Digitale sarebbe necessario a valle un filtro analogico molto aggressivo che per sua natura impone una corruzione della fase originale del suono e non rimuove in maniera esaustiva le immagini speculari delle alte frequenze. Questo si traduce in una perdita di fuoco della scena sonora ed un indurimento delle alte frequenze. I filtri digitali tradizionali sono realizzati tramite una serie di filtri FIR (Finite Impulse Response) ciascuno dei quali raddoppia la frequenza di campionamento. I dati che viaggiano tra un filtro ed il successivo sono memorizzati solitamente con una risoluzione inferiore ai 40bit. Poichè il filtro successivo lavora con i dati elaborati dal filtro precedente si ha una perdita di risoluzione ad ogni passaggio. Questa perdita di risoluzione di solito non emerge quando si usano ottimi sistemi di filtraggio convenzionale con DAC standard a valle, ma sono drasticamente evidenti quando utilizzati con i DAC MSB di Seconda generazione con alta risoluzione a 24bit. Con un filtro digitale standard il suono si presenta velato e sporco in relazione alla brillantezza ed alla naturalezza espressa con l’utilizzo del filtro digitale sovracampionato 16x di MSB che filtra in un’unica sessione a 32bit di risoluzione in ingresso, 80bit di potenza di computazione e coefficienti a 36bit. La maggior parte dei filtri digitali FIR inoltre opera continui arrotondamenti sui risultati del filtraggio di una sequenza di campionamento prima di aggiungere la successiva e questo introduce gli stessi inconvenienti descritti per l’approccio dei filtri FIR 2x. Il filtro digitale MSB realilizza una perfetta accumulazione di bit in un accumulatore da ben 80bit eliminando compleatmente i problemi evidenziati con i filtri FIR. Solo come ultimo passaggio e con estrema cura vengono convertiti i dati in una stringa da 24bit di cui il DAC MSB necessita. Un altro fattore determinate per la qualità di riproduzione audio è la qualità e la tecnologia utilizzata per il clock di conversione del DAC. Qualsiasi modifica del periodo della frequenza o “jitter” causa una perdita di focalizzazione e delle imprecisioni. L’elevata potenza e l’ampio spazio di memoria del nostro DSP SHARC ci permette di offrire un formidabile Ultra Clock al nostro filtro digitale 16x. Questo consiste in due oscillatori TCXO di altissima precisione e dal “jitter” praticamente assente. Questo circuito permette molto più che un reclock dei dati (come avviene nella maggior parte del filtri digitali in commercio per ridurre il “jitter”) ma la vera e propria sostituzione del clock in ingresso. La maggior parte dei sistemi di riduzione del “jitter”sono di tipo Phase Locked Loop o Asynchronous Sample Rate Converters. Il Phase Locked Loop è in grado di ridurre il jitter in modo significativo ma non lo elimina poichè il clock di uscita deve essere correlato con il clock in ingresso. L’Asynchronous Sample Rate Converter, che sostituisce completamente il clock, sembrerebbe ideale finchè non ci si rende conto che l’alto carico di computazione necessaria al funzionamento introduce essa stessa del jitter nei dati. La conversione Sample Rate non è anch’essa ottimale per l’utilizzo poco performante dei filtri digitali coinvolti che devono mutare nel tempo la loro risposta per produrre il clock di output. Il sistema Ultra Clock di MBS supera entambi questi problemi immagazzinando i dati in arrivo in un buffer estremamente grande (1/2 secondo audio). Il clock residente può quindi leggere i dati privi di jitter ed è in grado di trasferirli integri all’uscita in quanto è completamente indipendente dal clock in ingresso. Questo processo è interamente in carico al DSP che si assicura che ogni frequenza di campionamento abbia il proprio clock debitamente sostituito. Le frequenze di campionamento compatibili sono 44.1Khz, 96Khz, 176.4Khz, 192Khz, e 384Khz. 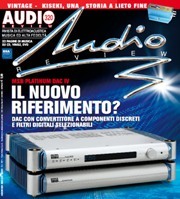 Recensione a sei mani del Platinum DAC IV di MSB su Audioreview di Marzo 2011. Marco Benedetti, Roberto Lucchesi e Fabrizio Montanucci ci illustrano le meraviglie di questa elettronica.
" (con musica in risoluzione 176,4KHz) ... sembra che qualsiasi amplificatore, anche il meno potente, disponga di una riserva di potenza quasi infinita: il livello indistorto sembra non avere un limite se non quello fisico dell'orchestra che suona. Mai altre volte la prestazione dinamica in gamma bassa ha raggiunto questi livelli di eccellenza nella nostra sala di ascolto." "La sensazione è che i diffusori non esistano più, non c'è più il limite fisico della loro altezza e della loro disposizione: è tutta la parete di fondo a diventare un unico e grande diffusore." "... tutta la gamma audio è completa, ricca, senza sbilanciamenti o sensibili lacune. La gamma più bassa è incredibilmente potente e solida e allo stesso tempo ben ferma e senza code. (...) l'altissima corretta, precisa, ben definita senza essere mai fastidiosa. Potente ed estesa la gamma media." " (con musica in alta risoluzione) ... l'impatto risulta devastante in toni assolutamente positivi: i particolari, le sfumature, il senso di dimensionamento risultano diverse unità di misura superiori (al formato CD): la timbrica sicuramente acquista maggior valore ma è sul piano della dinamica e della riproposizione della scena che l'alta definizione fa sentire in maniera evidente la sua superiorità. Tra il piccolo triangolo così minuto e delicato e le imponenti grancasse e timpani non avviene nessuna compressione (...) Ma ancora più impressionante il muro di suono: non sono più i due diffusori a suonare ma è tutta la parete di fondo nelle sue dimensioni totali a vibrare per proiettarci ad un passo dalla grande orchestra, quasi circondati da essa." "Con la sua alimentazione a batteria, il convertitore sviluppato “in casa” ed il suo filtro digitale sovracampionato 16 volte, il Power DAC si propone come un convertitore “a parte”, originale, estremamente performante e superbamente musicale. Sulle uscite non bisogna esitare ad utilizzare un cavo di buona qualità per collegare l’MSB ad un preamplificatore. Questo convertitore è di una trasparenza eccezionale e merita di essere associato ad un preamplificatore dalle capacità paragonabili (...) A questo livello di qualità il minimo difetto si percepisce nettamente e rischia di diventare intollerabile. Sul nostro disco test « The Pulse » traccia 5, ci si rende rapidamente conto che si ha a che fare con un “grande” convertitore. Dai primi secondi si pensa di stare ascoltando un disco analogico dove il rumore ed i disturbi tipici del vinile semplicemente non disturbano l’ascolto. I piani sonori si delineano nello spazio con una facilità non comune. L’immagine sonora offre una prospettiva sorprendente di realismo aprendosi ampiamente dietro i diffusori fino verso il fondo ed i lati della sala. Sul brano « Juslang » delle « Cantate Domino », il Power DAC si distingue da molti suoi concorrenti per una immagine stero stabile, concisa, molto realistica. L’organo si “installa” bene al suo posto, nelle retrovie, mentre la cantante si posiziona su un piano molto più ravvicinato con una precisione formidabile. Il timbro della voce è di una dolcezza notevole. Questa dolcezza non si traduce in una sensazione di carenza o velatura del medio acuto, ma piuttosto in una assenza di durezza nonstante il livello sonoro importante nello spettro delle alte. Possiamo spingere il volume senza mai sentirci aggrediti né frustrati dalla mancanza di informazioni in gamma medio alta. “Più lo si ascolta e più lo si ama”... Questo convertitore MSB ci ha particolarmente conquistato per la sua estetica sonora a due facce: con una capacità di analisi esemplare, una poroposizione reale dei dettagli ed una restituzione dei timbri sempre calorosa, con un carattere “analogico” particolarmente seducente. Trasparente e naturale il Power DACè un convertitore realmente musicale che sa far passare le emozioni con un facilità sconcertante. Un apparecchio che consigliamo vivamente a tutti gli audiofili e amanti della musica che ancora oggi sono poco convinti del digitale. " "La vera forza del Platinum DAC III Signature è l’omogeneità delle sue performances. E’ l’encomiabile equilibrio di cui dà prova in ogni circostanza che ne fanno un interprete a volte nascosto ma terribilmente efficace della musica. Durante le settimane della sua permanenza in sala, non ho mai smesso di farmi sorprendere dal semplice piacere di farmi cullare dalla melodia, riscoprendo i miei dischi dall’inizio alla fine piuttosto che restare concentrato sull’analisi di un passaggio. E’ il più bel complimento che io gli possa fare, poichè quando per lavoro si è abituati a sessioni d’ascolto quotidiane di più ore, occorre che l’apparecchio sia veramente eccezionale per lasciarsi andare senza pensieri assaporando la musica." "Un altro ambito in cui l’MSB afferma una superiorità insolente è quello della dinamica. Sull’intero spettro, fino agli estremi della banda passante, l’MSB di mostra una propensione entusiasmante per la risoluzione e la microdinamica." "Le sue superlative capacità in termini di immagine stereo e fluidità di banda passante si mettono al servizio dell restituzione di una musicalità veramente rara al fine di avvicinarsi chiaramente all’ascolto di un supporto analogico senza privarsi della precisione del digitale." “...il Platinum DAC III merita senza dubbio un successo commerciale grazie alle sue indubbie eccelse qualità: da acquistare e tenere a lungo quindi, od almeno in attesa che MSB divenga anch’essa un punto di riferimento come lo sono divenute DCS, Metronome, EMM Labs...”. "Prodotto di alta gamma che non segue conformismi industriali senza cadere nell’esoterismo più spinto, il Platinum DAC III è una realizzazione funzionale e moderna, la cui finezza di riproduzione lascerà più di un audiofilo stupefatto." Così la prestigiosa rivista francese Revue du Son che ha premiato il Platinum DAC III con le 5 stelle (il più rinomato riconoscimento in Francia per un'apparecchiatura hiend).